Wellness is an important part of both a general approach to life and student mental health. Fine Arts students often find themselves under additional pressures not shared by other students across campus, given the demands of rehearsals, instrument practice, performance and the push to be creative on top of maintaining a regular class schedule and keeping grades up. Add to that the unique physical demands that go with being a creative practitioner and you’ve got a lot of good reasons to stay healthy during your academic career. 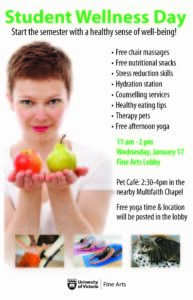 And don’t miss the therapy pets at the nearby Pet Cafe (2:30 – 4pm at the nearby Interfaith Chapel), as well as free yoga from 4:30-5:30pm in Hodges 104 (Residence Hub), brought to you by UVic’s SHAPE (Student Health Ambassadors and Peer Educators). Please join us for this fun and healthy event!